For over 15 years BC HIgh has offered a top notch, academic courses in a wide variety of areas including SAT and ACT Prep, College Essay and the Common App as well as courses for HS credit or as an enrichment course. Courses are designed to enhance a students education in an area they may want to excel or to prepare them for courses in the upcoming school year. No matter what your student's interests, we offer a summer academic program that will help them excel and enhance their high school course load. When: Summer of 2019. June 24th and August 9th at BC High from 9 AM to 12 PM. Who: Members of the Class of 2020 in collaboration with leaders and innovators within the BC High community and alumni network. Why: We believe this seminar is aligned with the Ignatian practices that BC High offers to our students. It is our hope that through the course, students will develop a better understanding of themselves, their talents, and their aspirations for the future. We also believe this unique experience will highlight the students’ commitment to learning and their pursuit of opportunities to grow which in turn will further distinguish them. This is a rigorous course which is open to highly qualified students who have a sincere interest in ancient languages and history. Students will have demonstrated a proficiency in their first-year language course (B+ or higher). Latin is not required to take Greek. The course will cover basic forms of grammar, syntax and vocabulary. Students will progressively read adapted Greek tales from Greek mythology. Cultural units will include the historical developments of Periclean Athens, and a thorough reading in translation of both Sophocles’ Oedipus Rex and Antigone. This class is open for rising seniors from public, independent or parochial schools who want additional guidance through the college application process and/or want to have their college application process already in motion before the school year starts. During this 4-day co-ed course students will work closely with a BC High guidance counselor to compose their Common Application essay and complete the basics of the Common Application. In addition, students will receive assistance in the college search and selection process. Students will have homework assignments during this boot camp primarily related to drafting their essays. This course is designed to prepare students for successful completion of the exams administered for entrance into Middle School the ISEE. The exam includes 5 sections: Verbal Reasoning, Reading Comprehension, Math Achievement, Quantitative Reasoning and Essay. The course will include instruction on test taking strategies, learning and reviewing content covered in the exam. Three practice tests are administered. The first day and two other times during the session practice tests will be administered at the discretion of the instructor to track the student's progress. This course is designed to prepare students for successful completion of the exams administered for entrance into High School, the HSPT and the SSAT. The exam includes 5 sections: Verbal Reasoning, Reading Comprehension, Math Achievement, Quantitative Reasoning and Essay. The course will include 15 days of instruction to include test taking strategies, learning and reviewing content covered in the exam. Three practice tests are administered. The first day and two other times during the session practice test will be administered at the discretion of the instructor to track the student's progress. 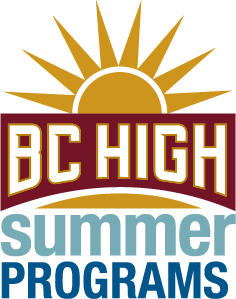 BC High offers the complete Summit Review course, including successful strategy concepts and proven test-taking techniques in the areas of English, Math, Reading and Science. Three practice exams are included and administered in this course. The first day and last day is a practice test and one other practice test will be administered at the discretion of the instructor to track the student's progress. Attendance at every class is expected. BCH STUDENTS MAY ONLY CHOOSE EITHER THE ACT OR SAT FOR FREE. BOTH COURSES MAYBE TAKEN BUT ONLY ONE IS FREE. The SAT exam is a measure of the critical thinking skills you'll need for academic success in college. The SAT includes a Critical Reading, Math, and Writing section, with a specific number of questions related to content. Three practice exams are included and administered in this course. The first day and last day is a practice test and one other practice test will be administered at the discretion of the instructor to track the student's progress. Attendance at every class is expected. This course is a good introduction to what is covered in Geometry. It is useful for those taking PSAT test who have not taken Geometry. Exploring Geometry will look at a number of different topics ranging from triangles and polygons, angles, parallel lines, similar figures, area, perimeter and volume. The class will also cover Pythagorean Theorem and special right triangle rules. This course is designed for students who are entering Algebra I in the fall and wish to augment their arithmetic skills for fractions, percents, and different number sets in the context of solving a linear equation. Other topics appropriate to the students’ skill levels will also be covered. This course, for grades 6 and 7, is designed to help improve knowledge of basic arithmetic operations with whole numbers, fractions, decimals, and percentages. This course is designed for students who demonstrate aptitude for mathematics and who performed very well in an Algebra II class. This class will cover the topics in trigonometry necessary to take Calculus Honors or AP Calculus, including the unit circle, the six trigonometric functions and their graphs and values, trig equations, and application of those functions. The course will rapidly cover the necessary topics to determine if students would adapt well to the rigorous pacing of an AP class. Upon successful completion of the class, students will be recommended for AP Calculus, Honors Calculus, or Pre-calculus. This course is designed for students entering grades 6, 7, and 8 who need to improve their English grammar and writing skills. Students will review vocabulary, basic grammar, basic writing skills, paragraph unity, and coherence. Students will also read short works of fiction and write critical analyses based on their reading. This enrichment program is designed for boys and girls who want an experience as an ensemble and as a soloist. There will be an introduction to some of the best vocal musical examples from around the world in a wide variety of languages. Students will learn techniques for developing their musical imaginations, intellect, and musical understandings. At the end of the two-week program students will conduct a grand performance for families and friends. For the boys and girls with or without musical experience! Come create beautiful music together using hand chimes, xylophones, and drums. Play vocal games, learn signing and breathing techniques and the development of basic music ensemble skills. This program will combine different aspects of music education listening to and comparing classical and folk music, discuss lives of composers and develop the ability to understand music language. At the end of the two-week program students will conduct a grand performance for families and friends. This course will provide students with basic, practical ways to study across the curriculum. The first lessons will focus on behavioral and organizational skills and will provide students with opportunities to discover how they learn best. Units on time management and note taking will lead into subject-specific study techniques, reading comprehension, and writing skills, as well as test-taking tips. This course is for sophomores, juniors and seniors. This course enables students to learn chemistry through experimentation and observation. Organizing the concepts, theories, and principles of chemistry allows students to develop an understanding of the materials that make up our world, the forces that bind them together, and the laws that govern changes in materials. The daily work in chemistry places emphasis on applying concepts, analytical reasoning, and problem solving using dimensional analysis. The use of a scientific calculator is required. This course is for sophomores, juniors and seniors. Chemistry I Honors differs from Chemistry I in that a greater number of topics are covered in greater depth and the expectations are that the students will develop higher-level analytical skills. Those topics include thermodynamics, molality, colligative properties, introductory organic chemistry and preparation for the Chemistry SAT II. Students taking Chemistry Honors will be combined with Chemistry I students and be challenged differently in classwork, homework and tests. The goal of the course is to introduce students to the 10 Chemistry topics which tend to pose the greatest difficulty. We begin with the Mathematics of Chemistry, Atomic Structure, Atom and Ion Names, Compound Formation, Molar Mass and Percent Composition, Empirical and Molecular Formulas, Stoichiometry, Gas Laws, Lewis Structures, and Geometries. Additional emphasis is placed on developing note taking skills, utilizing flash cards for improving memorization, production and use of visual aids in problem solving and keeping an organized notebook. This course is for juniors and seniors and can serve as a strong preparation for the potential science major or as an overview of physics. The following topics are covered: basic concepts of force and motion; work, energy, power, momentum; circular motion; gravitation; wave behavior and the nature of light; electricity. This course presumes a basic understanding of algebraic manipulation and geometrical reasoning. The use of a scientific calculator is required. Laboratory activities will clarify, test, and extend the concepts discussed in class. This course is for juniors and seniors and will cover the topics listed in Physics at an increased pace and a more sophisticated level. Students taking Physics Honors will be combined with Physics students and be challenged differently in classwork, homework and tests. This course serves as an introduction to photography through digital imaging. Emphasis will be placed on developing composition and aesthetic skills, technical craftsmanship, and critical analysis. A text is provided that covers camera fundamentals and addresses technical information. Students will be shooting a series of photographic assignments on campus and at home in addition to learning from the text. It is highly recommended that each student has his or her own digital camera to complete the homework assigned in this course. Time: 10:15 a.m. - 12:15 p.m.
Students will learn the fundamentals of drawing which is the basis of visual thought. Through the use of traditional techniques, students will be developing and refining their skills of observation and visual communication. Subjects explored will include the human figure, perspective, still life, landscapes, and cartooning. An assortment of media will be available including ink, colored pencil, charcoal, marker, and graphite. In addition to student production, understanding of aesthetics, art criticism, and art history are incorporated into the course. This course is geared for High School students who wish to improve and augment their academic writing skills. Students will be required to write and read daily. Students will write academic essays that will require them to analyze, compare and define specific ideas. The class will review the writing process including: organization, clarity, development, sentence structure and grammar. This course is designed for students in Middle School who need to improve their English grammar and writing skills. Students will review vocabulary, basic grammar, basic writing skills, paragraph unity, and coherence. Students will also read short works of fiction and write critical analyses based on their reading.